We really appreciate your interest in our trailers. Our commitment to product quality and environmental protection makes us an ISO9001:2008 and ISO14001 certified trailer manufacturer in China. YTO trailer has the following outstanding characteristics. 1. YTO trailer is designed for carrying large-sized and non-detachable goods, including machinery equipment, large tanks, ultra-high containers, and steel products, etc. 2. It features low dead-weight, rational structure, strong material carrying capability, aesthetical appearance, simple maintenance and high price performance ratio. 3. 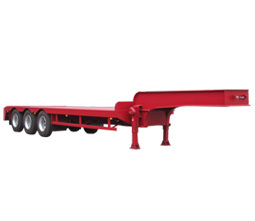 The gooseneck style trailer frame effectively reduces the flatbed height. The low and large flatbed enables us to load and unload large goods conveniently. In addition, the gravity center is low after the trailer is loaded with goods, which ensures high safety standard. 4. We can supply trailers with a wide range of specifications and models, thus satisfying customers' different demands. 5. The adoption of ladder and tool kit embodies our user-friendly design philosophy. 6. This trailer is characterized by great stability even running on uneven roads, due to our adoption of balance devices for front and rear leaf spring suspension system. As an agriculture machinery and construction equipment manufacturer with 50 years of experience, we also provide crawler tractor, crawler excavator, concrete mixing plant and wheel loader, etc. which are CE, E-mark and CCC certified. For more information, please send us an email or give us a call directly.